Editorial: "I am the best!" This case report describes a minimally invasive step-by-step approach to treat a patient with amelogenesis imperfecta. This is a genetic developmental disorder of the dental enamel, which clinically manifests as white and dark discolorations of the teeth. The clinical examination did not reveal the true depth of the staining. Therefore, a step-wise treatment approach was chosen. The first step consisted of a home bleaching procedure, which led to a slight improvement of the esthetic appearance, but the stains were still clearly visible. The next step was the application of a microabrasion technique. This led to further improvement, but not to a satisfactory result for this patient who had high esthetic expectations. Thus, the third step was undertaken: it was planned to restore the maxillary incisors and canines with ceramic veneers. The dental technician prepared a wax-up, which served as a basis for a clinical mock-up. After discussing the mock-up and the treatment plan with the patient, crown lengthening was performed on teeth 11 and 23 to improve the pink esthetics. Subsequently, the teeth were prepared in a minimally invasive way and a final impression was taken. Following try-in, the six veneers were inserted with resin cement. When starting a case, having the end result in mind is the basis in any kind of treatment, even more so in those where the anterior teeth morphology, size and proportion will be changed. Here is where a good treatment plan based on a diagnostic wax-up that is tried in with a mock-up and approved by the patient becomes crucial. This case report exemplifies how transferring the information from the diagnostic wax up to the patient's mouth is of help not only to the restorative dentist and the laboratory technician, but also to the surgeon when performing the crown lengthening. This treatment plan cannot be seen as a sequence of isolated procedures but as a single workflow. The wax-up/mock-up binomial is a guide even for the periodontist in a novel approach to surgical crown lengthening. Finding reliable systems that can help the clinician match the color of direct composite restorations is often an issue. 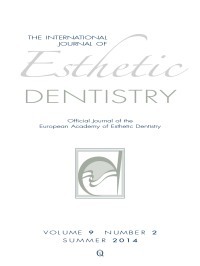 After reviewing several composite shade guides available on the market and outlining their main characteristics and limits (unrealistic specimen thickness, not made with the same material the clinician will use, only a few allow to overlap enamel tabs on dentin ones), the authors evaluated the reliability of a system designed to produce self-made standardized "tooth-shaped" shade guide specimens. Small changes in composite enamel thickness may determine huge differences in esthetic outcomes. In conclusion, the results showed that all the specimens demonstrated comparable enamel thickness in all the examined areas (cervical, middle, incisal). The following study asks three principle questions relative to composite finishing and composite polishing: 1) Will the superficial roughness of different restoration surfaces have different values, utilizing the same polishing system (multistep), after finishing with the tungsten carbide or diamond bur? 2) Under the same conditions of finishing and polishing sequences, will the composite surfaces (C), the composite-enamel (CE) and composite-dentin (CD) interfaces show different roughness values? 3) Will the surface roughness of composites of different translucency in the various phases of finishing and polishing, and on different interfaces, have different results? The null hypothesis is represented by the fact that there are no significant differences on roughness of composite restorations when polishing, after finishing with tungsten carbide or diamond burs. Furthermore, the null hypothesis is that there are no significant differences on roughness between polishing on composite surface, composite-enamel and composite-dentin interfaces, and finally there are no differences on roughness after finishing and polishing of two composite with different translucency. For the study, 56 class V cavities were prepared on extracted teeth. Restorations were done in nanofilled composite Filtek XTE (3M Espe) in a standard fashion, and then finished and polished. The 28 buccal cavities were restored on the surface with composite enamel and the 28 palatals with composite body. Finishing was done with fine toothing burs in tungsten carbide (16 blades) or fine grit diamond burs (46 μm), and made by the same manufacturer (Komet). The second phase of finishing was done with burs (with the same form as already mentioned) ultrafine toothing tungsten carbide (30 blades) or with extra and ultrafine grit diamond (25 and 8 μm). The polishing phase for both of the earlier sequences was done with the application of three rubber tips with decreasing abrasiveness and an application with a self-polishing brush. All measurements were taken from surfaces C, and interfaces CE and CD. Statistical analyses were carried out with c2 test (a = 0.05). Conclusions: 1) There were no relevant differences of surface roughness on the different surfaces if the polishing was done after finishing with tungsten carbide or diamond burs. 2) Keeping the same sequence of finishing and polishing, a difference was noticed between C, CE and CD, where the latter showed greater roughness. 3) Analyzing the data in all the phases of finishing and polishing on every interface, it can be concluded that the composite enamel and the composite body did not show different levels of superficial roughness. The clinical relevance could be resumed as follows: no difference after polishing, which is preceded by tungsten carbide or diamond finishing burs. The less favorable interface to be polished is CD, compared to CE and C. Considering two composites with different translucency, no difference on roughness after finishing and polishing were detected. In contemporary dentistry, we have a vast range of materials to choose from, and metal free restorations have become the premier materials for achieving the ultimate in both esthetics and durability. Metal-free restorations are utilized with more conservative preparations to preserve the vital natural dentition, and have proven to be superior alternatives to traditional porcelain-fused-to-metal (PFM) restorations in many cases. There are always "pros and cons" when selecting materials, and to make the best choice it is essential for dental professionals to plan precisely and understand their options in any clinical situation. - Required strength based on the patient's occlusion/dental habits. - Position of the margin. - Stump shade. Final shade. One of the most significant challenges in the metal-free dentistry is the reproduction of natural dentition without the influence of a "negative stump" - a very dark or metal core showing through the final restorations. There are many factors to be considered when working on such a case, and controlling the opacity of the coping and crown is the key to success. This article presents a unique "outside of the box" technique that provides consistent, predictable and durable restorations, which provide the best possible esthetic outcome. Objectives: To compare color and translucency changes after light curing and finishing in various shades of five contemporary resin composites. Methods: Light and dark (A1 & A4 or equivalents), enamel (e) and dentin (d), shades were selected from the resin composites Enamel Plus HRi (Micerium), Miris 2 (Coltene), IPS Empress Direct (Ivoclar), Filtek Supreme (3M ESPE) and TPH Spectum (Densply). Ten disc-shaped samples (depth = 10 mm, thickness = 1 mm) per material and shade were fabricated. Three colorimetric readings, over white and black background, according to the CIELab system were taken before and after light polymerization and after finishing with wet carbide papers. Color (ΔE) and translucency (ΔTP) differences were calculated. Results were analyzed by ANOVA, post-hoc Scheffe's test and linear regression analysis. Results: Polymerization provided a wide range of color change, ranging from 1.36 (Hri/UD1) to 8.07 (Miris/WB). Translucency increased in all groups, except Miris/NT. Translucency change varied from -0.4 (Miris/NT) to 8.88 (Hri/UE3). After finishing, ΔE ranged from 0.58 (Hri/ UD4) to 3.41 (Miris/NT). ΔE was significantly positively correlated with ΔL, Δb after curing and with ΔL, Δa, ΔTP after finishing. Conclusions: Polymerization caused remarkable color and translucency changes, which were product and shade dependent. Thirteen out of 18 of the tested resin composites exhibited clinically perceptible (ΔE>2.6) color change after light curing and 2 out of 18 after finishing. Clinical significance: Shade matching with non-polymerized resin composite may be erroneous. The primary goal of nonsurgical periodontal therapy is to control microbial periodontal infection by removing bacterial biofilm, calculus, and toxins from periodontally involved root surfaces. A review of the scientific literature indicates that mechanical nonsurgical periodontal treatment predictably reduces the levels of inflammation and probing pocket depths, increases the clinical attachment level and results in an apical shift of the gingival margin. Another parameter to be considered, in spite of the lack of scientific evidence, is the reduction in the degree of tooth mobility, as clinically experienced. It is important to point out that nonsurgical periodontal treatment presents limitations such as the long-term maintainability of deep periodontal pockets, the risk of disease recurrence, and the skill of the operator. A high number of posttreatment residual pockets exhibiting bleeding on probing and > 5 mm deep are related to lower clinical stability. The successful treatment of plaque-induced periodontitis will restore periodontal health, but with reduced periodontium. In such cases, anatomical damage from previous periodontal disease will persist and inverse architecture of soft tissue may impair home plaque removal. - Quadrant/sextant wise instrumentation (conventional staged debridement, CSD). - Instrumentation of all pockets within a 24-hour period with (full mouth disinfection [FMD]) or without (full mouth scaling and root planing [FMSRP]) local antiseptics. Both procedures can be associated with systemic antimicrobials. - CSD or FMD in combination with laser or photodynamic therapy. Patients with aggressive periodontitis constitute a challenge to the clinician. To date there are no established protocols for controlling the disease. However, data from the literature on the application of the FMD protocol combined with amoxicillin-metronidazole systemic administration are promising. A new classification in supra- and subcrestal nonsurgical periodontal therapy will be proposed. The supracrestal therapy includes the treatment of gingivitis, nonsurgical coverage of recession-type defects, treatment of suprabony defects and papilla reconstruction techniques. Within subcrestal periodontal therapy, it is of paramount importance to preserve both marginal tissues and connective fibers inserted in the root cementum at the apical part of the bony defects.